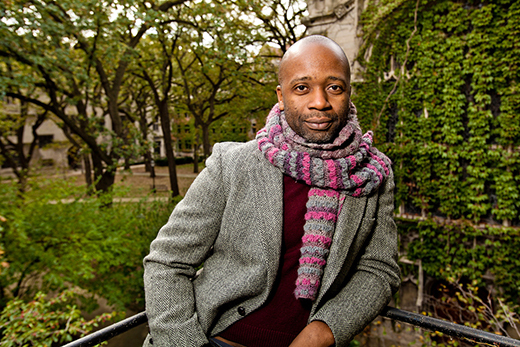 This year's Goodrich C. White lecture will be delivered by artist and professor Theaster Gates, director of arts and public life at the University of Chicago. He will discuss the role of art and culture in rebuilding communities. Photo by Jason Smith / Courtesy of the University of Chicago. With a nod to both the past and the present, Emory’s Founders Week will celebrate the University’s role in promoting inquiry and intellectual life with literary gatherings, lectures and music. The midwinter academic festival, which runs Feb. 1-6, commemorates the first official meeting of the founders of Emory College on Feb. 6, 1837 — two months after the state of Georgia formally granted a charter to establish the college. This year’s schedule includes a celebration of Emory authors and editors, a concert featuring swing-era music by an acclaimed clarinet septet, and three public lectures, which range from current scientific research on antibiotics to a look back into Georgia’s slave trade history and the perspective of a modern-day artist fueled by an interest in social transformation. Presented by the Center for Faculty Development and Excellence, sponsored by the AJC-Decatur Book Festival, and hosted by the bookstore, the Feast of Words features wine and hors d’oeuvres in honor of Emory faculty who collectively wrote or edited more than 100 books in 2015. The event includes remarks and a toast from Emory President James Wagner and Provost Claire Sterk. RSVP by Jan. 27 to mslavin@emory.edu. Bruce Levin, Samuel Candler Dobbs Professor of Biology, will speak on “Bacteria, Viruses, Antibiotics and Too Much Fun.” A population and evolutionary biologist, Levin is considered a leader in using mathematical and computer simulation modeling to study the evolutionary biology of bacteria and their viruses. He will discuss ongoing research on antibiotic treatment and antibiotic resistance. A reception follows. The Distinguished Faculty Lecture was developed in 1995 by the University Faculty Council as a means to recognize excellence amongst faculty across the University. Each year a lecturer is nominated by a special committee of the Faculty Council and approved by the University president and provost. Theaster Gates, an award-winning Chicago potter and artist who blends art installation with social practice, has gained renown for turning abandoned buildings in run-down neighborhoods into vibrant cultural hubs serving the community. Gates is director of arts and public life at the University of Chicago, where he is a professor of visual arts. He will discuss arts and culture as catalysts for social transformation and renewal of place and community. You can learn more about Gates' work through his TED Talk, "How to revive a neighborhood: with imagination, beauty and art." “Every generation has its artistic interpreter of how communities can transform themselves by paying attention to architecture and aesthetics," notes Gary Hauk, deputy to the president at Emory and chair of the White Lectureship Committee. "In the 1960s and '70s it was Buckminster Fuller. Today it’s Theaster Gates, and we are honored to host him at Emory." Free tickets are available through the Arts at Emory Box Office at 404-727-5050; limit two per customer. Established in memory of Emory's 14th president, the lecture is sponsored by the DVS Senior Honor Society and the President's Office. Kwesi DeGraf-Hanson, a landscape architect and Emory PhD in history, explores the identities and legacies of the enslaved persons involved in the largest recorded slave auction in U.S. history -- 429 slaves sold on March 2 and 3, 1859—and how the landscape of slavery still speaks to us. The talk also references a logbook for the “Wanderer,” the last documented ship that brought slaves to the U.S. in 1859, now held in Emory’s Stuart A. Rose Manuscript, Archives and Rare Book Library, along with papers belonging to the ship’s owner, Savannah businessman Charles A. L. Lamar. Julian Bliss Septet: “A Tribute to Benny Goodman,” 8 p.m., Schwartz Center for Performing Arts. Considered one of the world's finest solo clarinetists, Julian Bliss leads his septet through some of the great tunes of the swing era off their debut disc, "Benny Goodman — The King of Swing," as part of the 2016 Emory Annual Jazz Fest. Tickets are available for purchase through the Arts at Emory Box Office.